I would guess that even the most fervent supporter of modern metal would have to admit that, like most genres, there are a lot of bands who sound like one another. There are far fewer bands with a truly unique sound. Soulfly is definitely such an outfit. 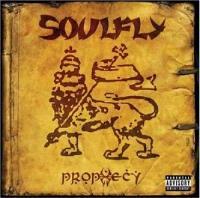 Formed by Max Cavalera when he left Sepultura, Prophecy is Soulfly's second album, and it certainly shows the group to be one who is undoubtedly not hindered by borders or labels. The music that Cavalera and band mates Marcello D. Rapp, Mikey Doling and Roy Mayorga produce seems to have no boundaries on it. At one point the CD shows the band cutting loose with incredibly powerful and heavy metal that would fit into the repertoire of any number of groups. The next, though, they are doing a cut which nearly seamlessly combines those same sounds with a very faithful reggae approach. On still other tracks the group move fairly fully into the progressive rock vein. There are even cuts that probably wouldn't pass as metal in virtually anyone's mind. What does remain consistent though is a sense of artistic integrity and intense creativity. You might not like everything this band does. You might not like any of it, but you truly have to admire their talent and sense of artistic adventure. It's not something you see every day. Personally, I really do enjoy the whole disc. I have a hunch some of the more die-hard extreme metal fans probably will not listen to some of the mellower cuts on the album. I would find it hard to believe that any old school prog fans would even give it a shot. The sad thing, though, is that if either of these groups really listened to this album with an open mind, they would learn what I know. This is an incredibly talented and driven band that is very diverse and creative. These guys are amongst the best in the genre. Although overall a pretty straightforward heavy duty stomper, this one includes suounds like sitar that are not often heard in this style of music. Also the vocals, while very aggressive, are very clear and well enunciated. This is a very strong cut. Starting with traditional middle Eastern tones, this one jumps up to another metal scorcher. It drops to a very expansive, nearly prog rock segment that is quite powerful. This one is the most aggressive thus far. It doesn't wander far, but is definitely not a weak number. This feels a bit too much like the one that came before. It's hard and fast, though. Although a bit like the previous two songs, this one includes a segment almost based on a middle eastern structure and some very interesting changes. Both of these factors raise it above those other two pieces. It drops back to a mellow proggy groove. This segment seems to wander between Latin and middle Eastern sounds. It is an extended and very powerful section. It even bounces into reggae territory. This is one of the coolest cuts on the disc, that proggy jam ending it. This begins with a balladic guitar style, then jumps into more frantic hard-edged metal. The cut includes some very tasty guitar work. It drops to a mellow spoken word segment that is very cool, then burst back up to the fury. It returns to the mellow section later. When it burst back into the heavy it's with a renewed intensity and the jam that follows is better for it. A false ending drops the track to a very gentle movement based on acoustic elements. When that section ends, it is the real thing. This is a very diverse and dynamic track. The reggae elements are back here big time with the intro and first verse in that style, Then a quick burst of very heavy metal comes and goes bringing back the earlier elements. After another verse the cut seems to merge the two sounds for a time until another full on reggae segment takes over. Then they work it back to the combined sound before jumping all the way up to the heavy. Next a fast paced, thrashy section moves it. It eventually gives way to a reprise of the reggae sound. This is worked into an extended jam that get s rather space rock oriented and proggy. Keys take it later, first into atmospheric, then Arabic tones that move straight into the next cut. Coming straight out of the previous one, an animal roar takes the cut into a heavy excursion. This still includes flourish of eastern and middle eastern overtones at times but is more or less a straight forward stomper for a couple of minutes until it drops back to an atmospheric and progish segment. This is very mellow, but quite dramatic. It jumps to a very prog rock related heavy segment that ends it. A mellow acoustic based jam start this and runs through for a while in a jazzy Latin groove. This ends, then a new hard-edged frantic segment takes it. The cut shifts gear to a more melodic jam after a time. Then the two elements fight for control. A frenzied guitar solo soars in. This drops to an acoustic tribal texture with sound effect keys overtop to serve as the ending. This jumps right in heavy and frantic. It stays pretty true to its roots for the first three minutes or so before dropping to a more acoustic based mellow world sounds based journey. The band build on this for a time, but this movement serves as the conclusion to the piece. A mellower one, this starts with just percussion. The group moves around various themes in this balladic instrumental style for a time. Creating a very beautiful and intricate melody painting. This one has a major progressive rock texture. It is quite cool and never moves into the metal vein. A Latin acoustic rocker mode with R & B type female vocals makes up the motif here for nearly the first three minutes. Then it shifts to a weird marching band type sound for several minutes. Some speaking in the background takes it for a while, then a dark and dramatic middle eastern texture takes over to carry the piece to its end.